This metal shelf is perfect for your kitchen. It has several shelves and side hooks. You can easily place a microwave as it can withstand up to 165lbs. Its silver finish protects the cabinet from water, oxidation and corrosion. This same finish combines seamlessly with most of the decorative styles of a kitchen. Apart from a kitchen usage, you can use it in the bathroom to place towels and other toiletries, or give it a more industrial use. This shelf is the ideal piece of furniture for your kitchen. De-clutter your kitchen countertop from kitchen utensils, cloths and glass containers and place everything neatly on this rack. 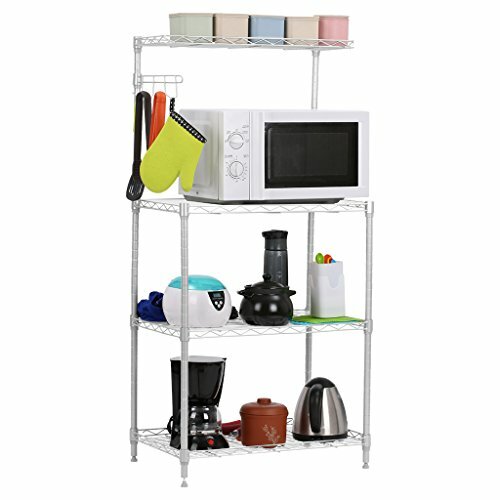 It has 3 metal mesh shelves so you can organize everything. It also has an extra top shelf and 4 side hooks, where you can hang your tools (spatulas, saucepans, skimmers and more). The assembly of this microwave shelf cannot be simpler. To avoid complications, you can assemble this piece of furniture without tools by simply using your bare hands. Set the shelves on top of the clips that hold them in place and make sure they are correctly inserted.